The hippo is one of the most recognizable and best-loved of all African animals, yet it can also be one of the most unpredictable. The species most frequently seen on African safaris is the common hippopotamus (Hippopotamus amphibius), one of only two remaining species in the Hippopotamidae family. The other hippo species is the pygmy hippopotamus, an endangered native of West African countries including Liberia, Sierra Leone, and Guinea. Common hippos are easily distinguishable from other safari animals, thanks to their totally unique appearance. They are the world’s third-largest type of land mammal (after all species of elephant and several species of rhino), with the average adult hippo weighing in at around 3,085 pounds/ 1,400 kilograms. Males are bigger than females, although at a young age they look much the same with bulky, hairless bodies and enormous mouths equipped with elongated tusks. Although hippos don't have particularly strong social bonds, they are typically found in groups of up to 100 individuals. They occupy a specific stretch of river, and although they breathe air like any other mammal, they spend the majority of their time in the water. They inhabit rivers, lakes and mangrove swamps, using the water to keep cool beneath the heat of the African sun. They socialize, mate, give birth and fight over territory in the water, but leave their riverine habitat to graze on the river banks at dusk. The name hippopotamus comes from the ancient Greek for “river horse”, and hippos are undoubtedly well adapted for life in the water. Their eyes, ears, and nostrils are all located on top of their heads, allowing them to remain almost entirely submerged without having to surface to breathe. However, although they are equipped with webbed feet, hippos can’t float and aren’t especially good swimmers. Therefore, they are usually confined to shallow water, where they can hold their breath for up to five minutes. Hippos have several other fascinating adaptations, including their ability to secrete a form of red-colored sunscreen from their two-inch/ six centimeter-thick skin. They are herbivorous, consuming up to 150 pounds/68 kilograms of grass every evening. Their poop plays an important role as an aquatic fertilizer. Despite their plant-based diet, hippos have a fearsome reputation for aggression and are highly territorial, often resorting to violence to protect their patch of river (in the case of male hippos) or to defend their offspring (in the case of female hippos). They may look awkward on land, but hippos are capable of short bursts of incredible speed, often reaching 19 mph/ 30 kph over short distances. They have been responsible for countless human deaths, often without apparent provocation. Hippos will attack both on land and in the water, with several accidents involving a hippo charging a boat or canoe. As such, they are generally considered to be amongst the most dangerous of all African animals. 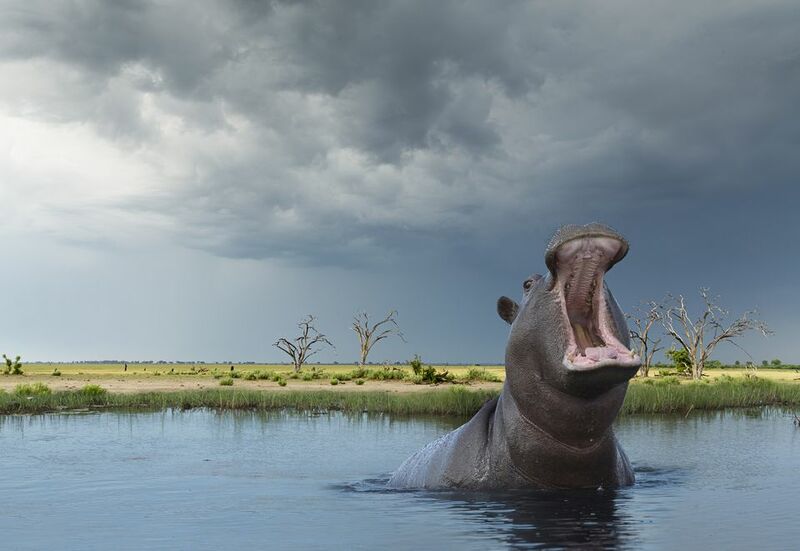 When angry, hippos open their jaws to nearly 180° in an intimidating threat display. Their elongated canines and incisors never stop growing and are kept perpetually sharp as they rub together. The tusks of male hippos can grow up to 20 inches/ 50 centimeters, and they use them to fight over territory and females. Unsurprisingly, while Nile crocodiles, lions and even hyenas may target young hippos, the adults of the species have no natural predators in the wild. Nevertheless, like so many animals their future is threatened by man. They were classified as Vulnerable on the IUCN Red List in 2006, after suffering a population decline of up to 20% over a period of ten years. They are hunted (or poached) in several areas of Africa for their meat and their tusks, which are used as a substitute for elephant ivory. Hippo poaching is particularly prevalent in war-torn countries like the Democratic Republic of the Congo, where poverty has made them a valued food source. Hippos are also threatened throughout their range by encroaching industry, which has affected their ability to access fresh water and grazing land. If allowed to live a natural life, hippos have a lifespan of approximately 40 - 50 years, with the record for the longest-lived hippo going to Donna, a resident of Mesker Park Zoo & Botanic Garden, who died at the ripe old age of 62 in 2012.